Flips in front of the crowd. First up - Dual Speed n Style. 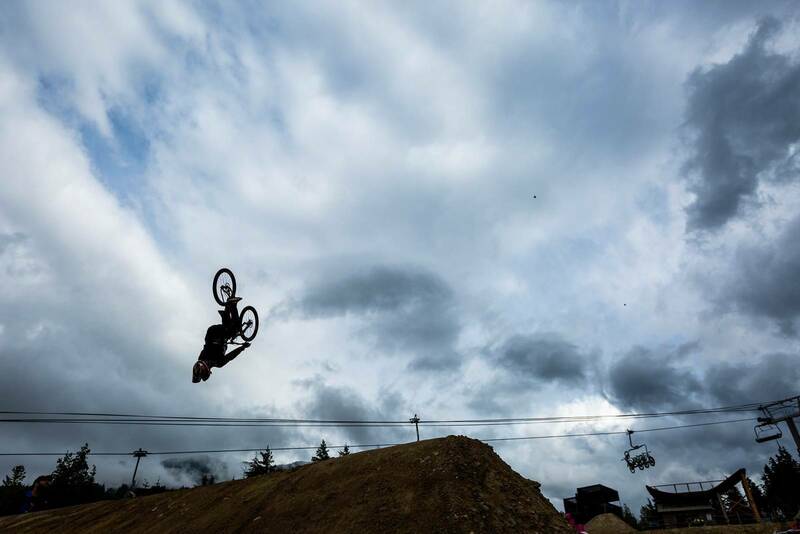 Rain clouds were glooming, but that didn't stop Kyle Strait flipping. 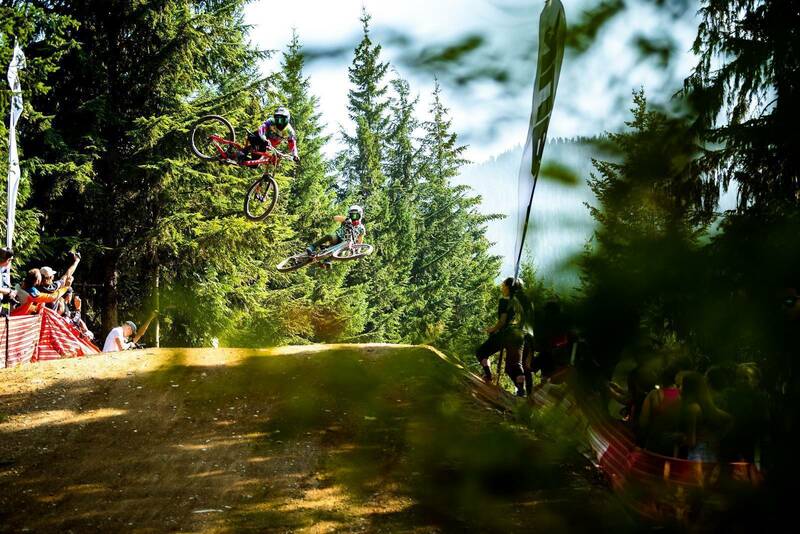 Between two trick jumps are a series of corners - this is where the speed aspect comes in. 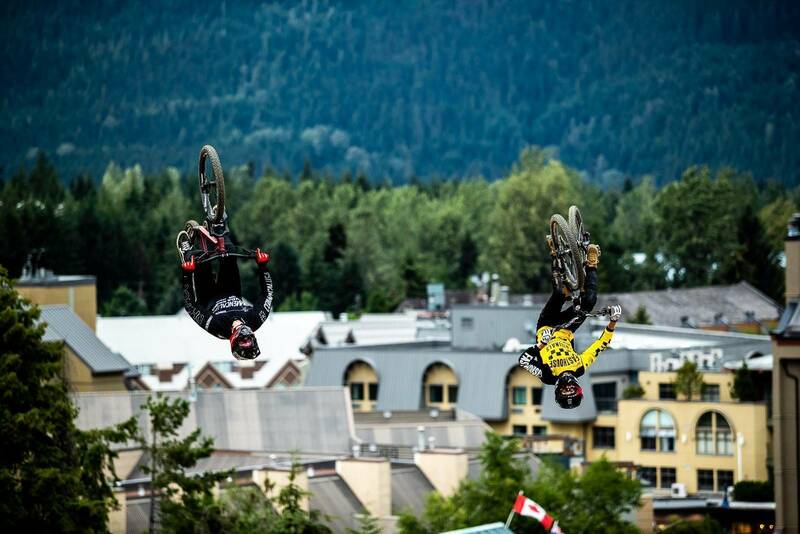 Strait with the backflip, alongside his long-term mate Cam Zink. 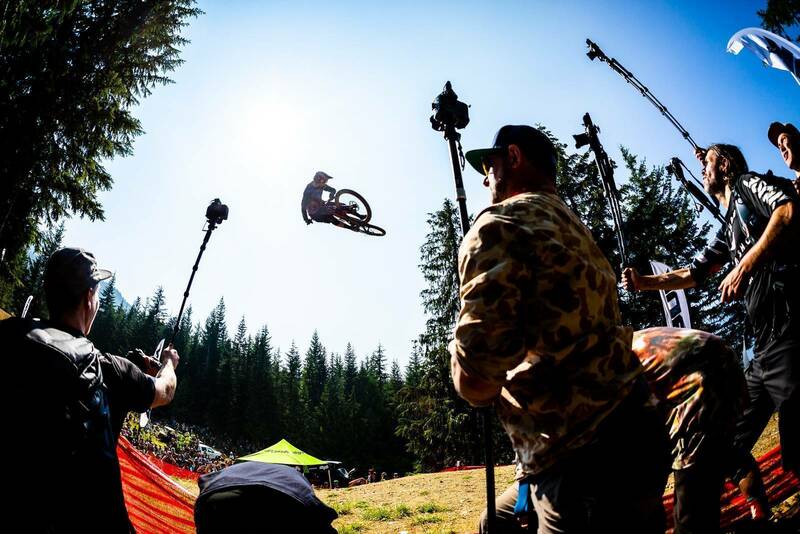 Barry Nobles attempted a double backflip, which unfortunately didn't end well. We caught up with him afterwards, saying that he's fine with a few sore ribs. 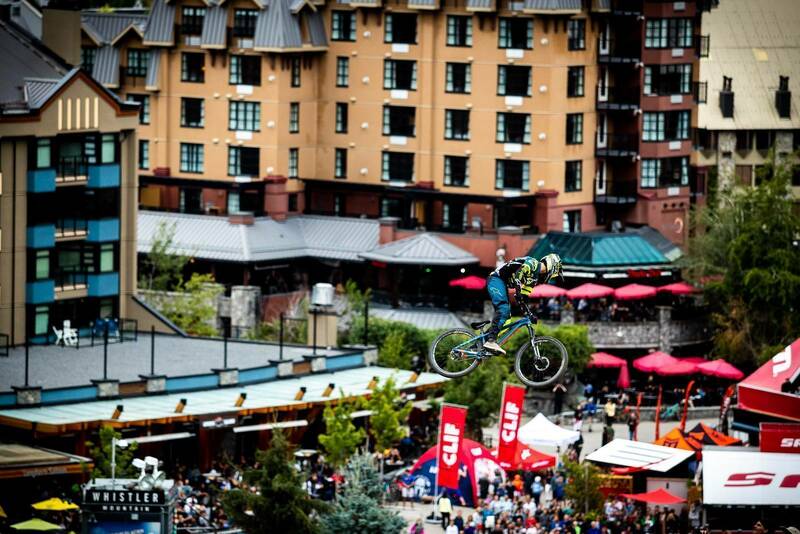 Sam Reynolds, 3rd, spinning over the Village. ... with a series of 360 barspins. 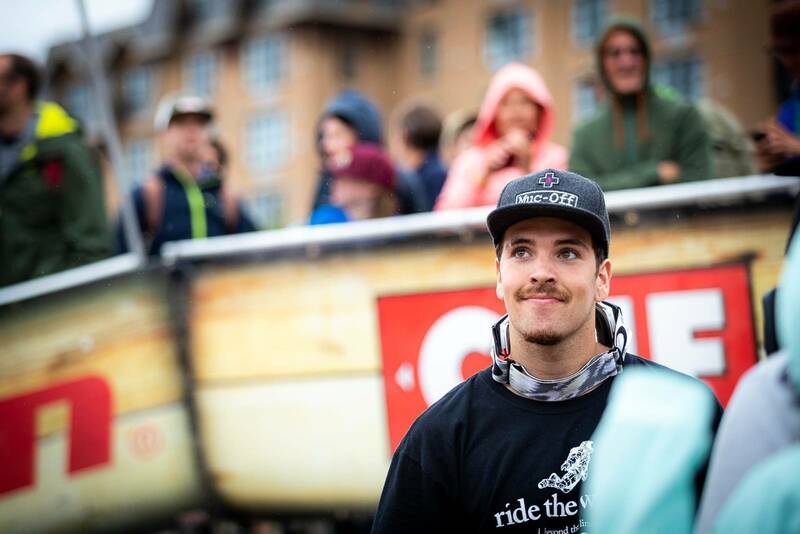 Lemoine - stoked on first place, and the overall. Next up - Garbanzo DH. 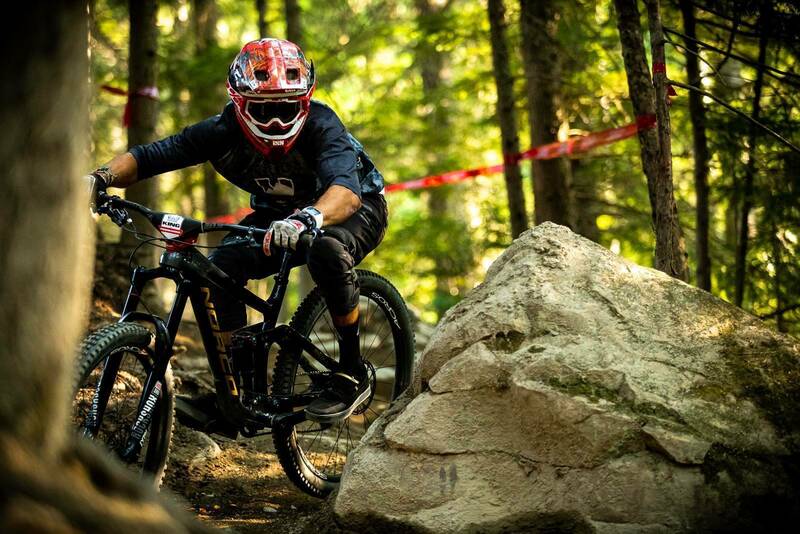 Marcelo Gutierrez couldn't make it happen this year, with a mechanical followed by a crash. Henry Fitzgerald - fourth place. 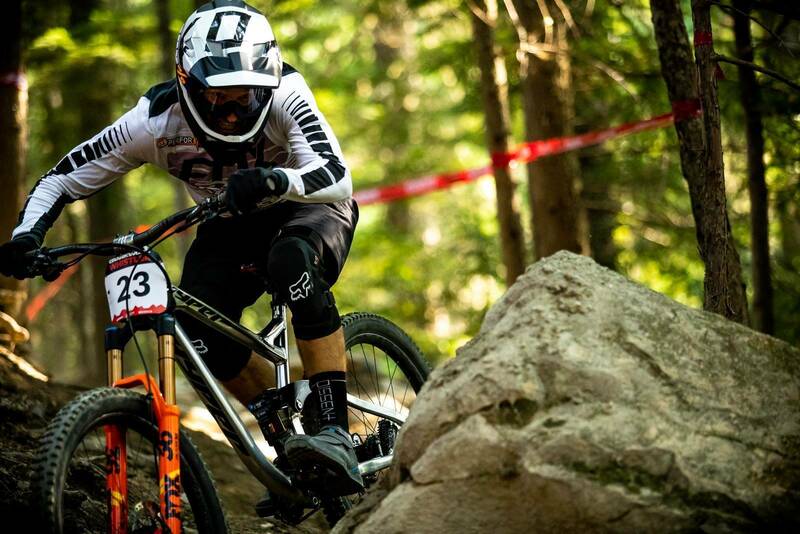 Aussie Sam Hill hopped back on a prototype Nukeproof downhill bike to better the time of second place Jacob Dickson by 1.3 seconds. 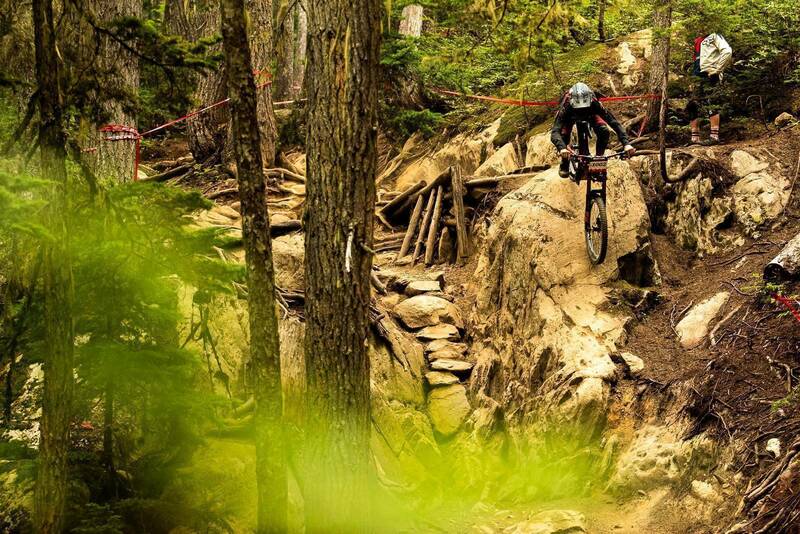 The Garbanzo DH goes down some of Whistler Bike Park's most technical trails - like this near-vert roller. Plenty of rock slabs can be found, too. Followed by horrible root gardens. 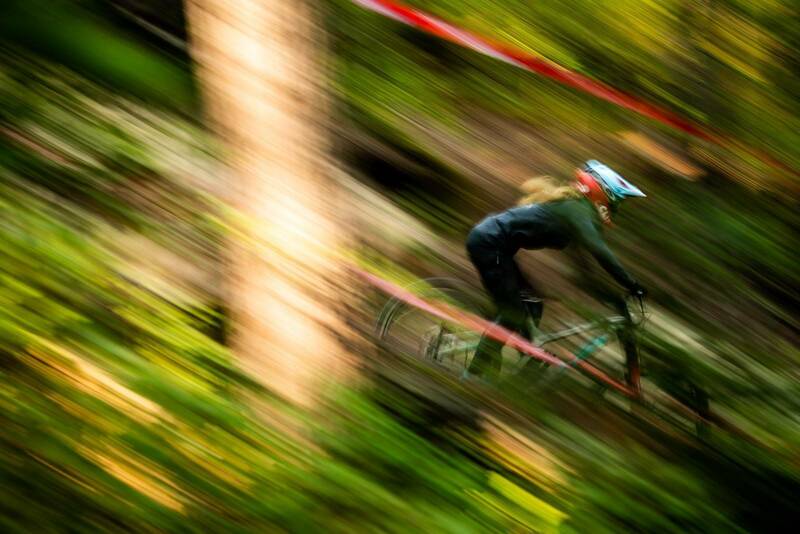 Claire Buchar takes second in the Garbanzo DH. Legend (And Aussie) Tracey Hannah takes third, behind Georgia Astle in first. 8.5 seconds separate the two. 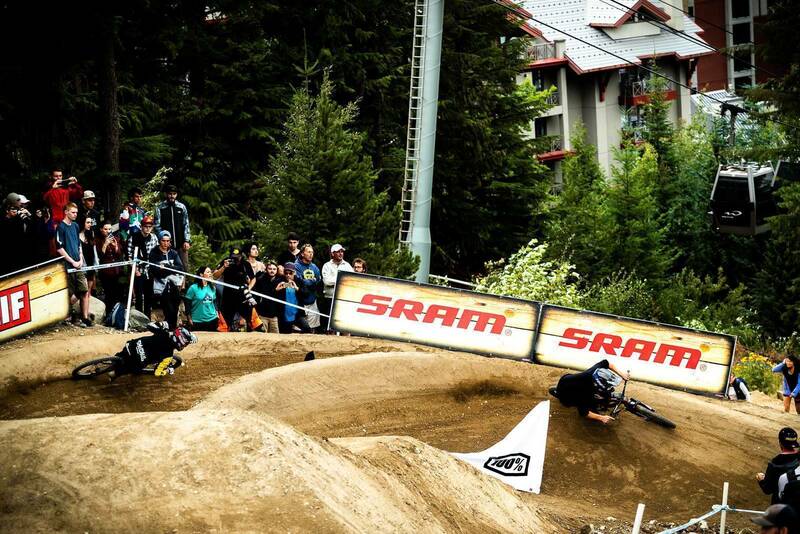 The next event was the Fox Air DH, running down Whistler Bike Park's famous A-Line. 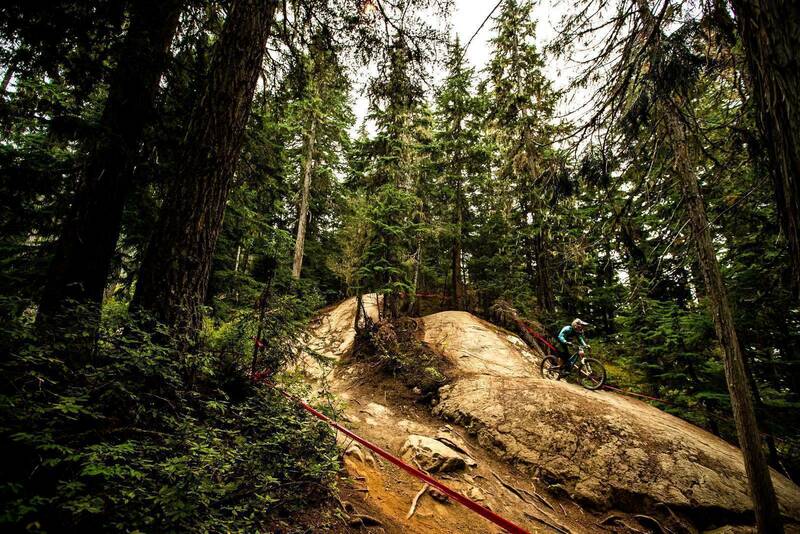 37 jumps and 34 berms are littered along the 500 metre-vertical track. A final tight and technical section brings competitors out into the finishing arena. 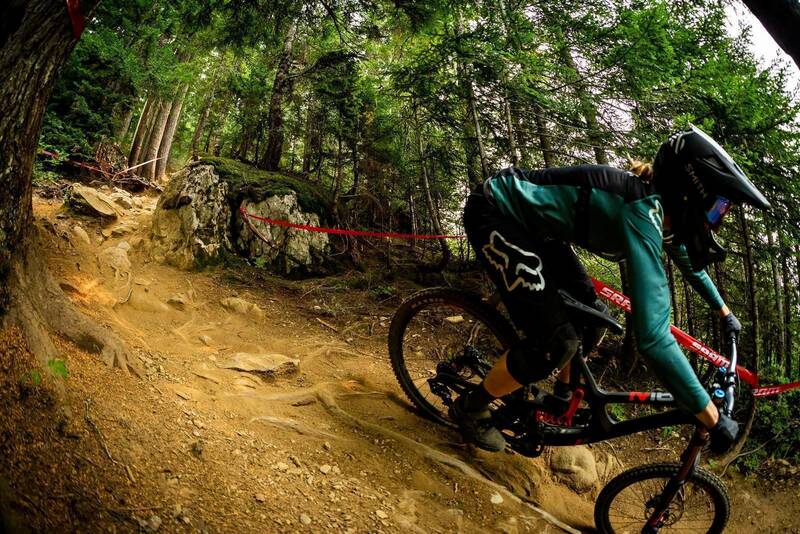 Jill Kintner - first in elite womens. Vaea Verbeeck back by only 0.040 of a second, with Casey Brown taking third place. Bas Van Steengerben, taking third to Finn Iles and Magnus Manson. 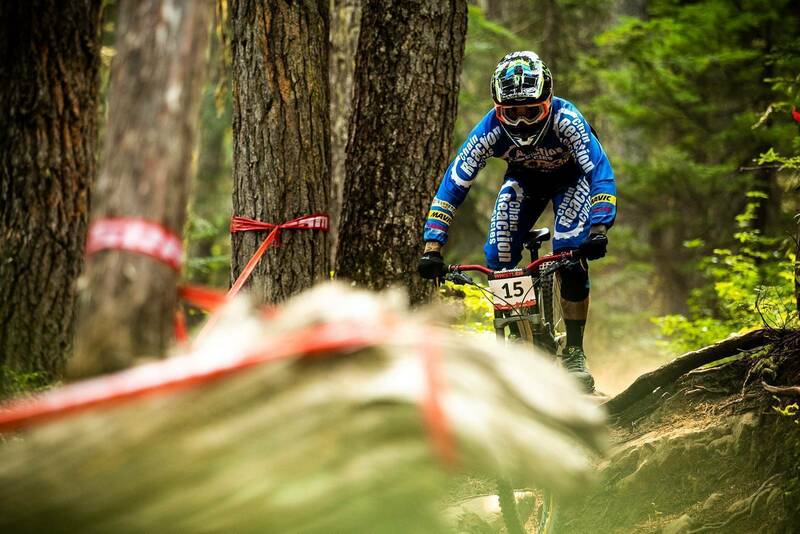 Adrien Loron couldn't quite make it happen this year, taking 5th behind Sam Blenkinsop. 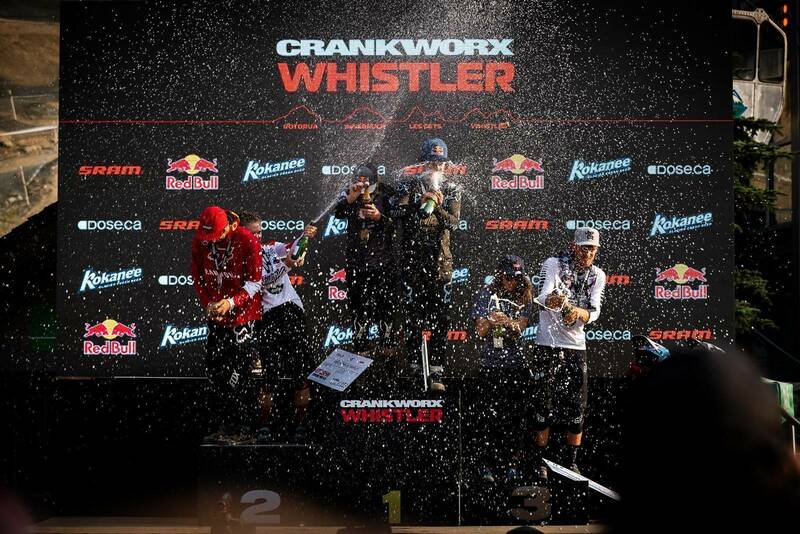 Your Fox Air DH Podium. 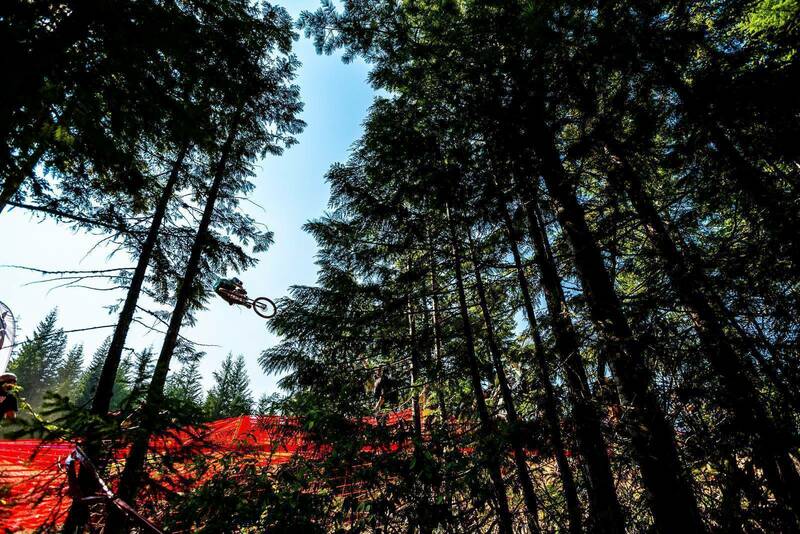 And on the 7th day, we saw whips. "It's not about the size of your stick, it's about how you use it" Says one of the media squids. 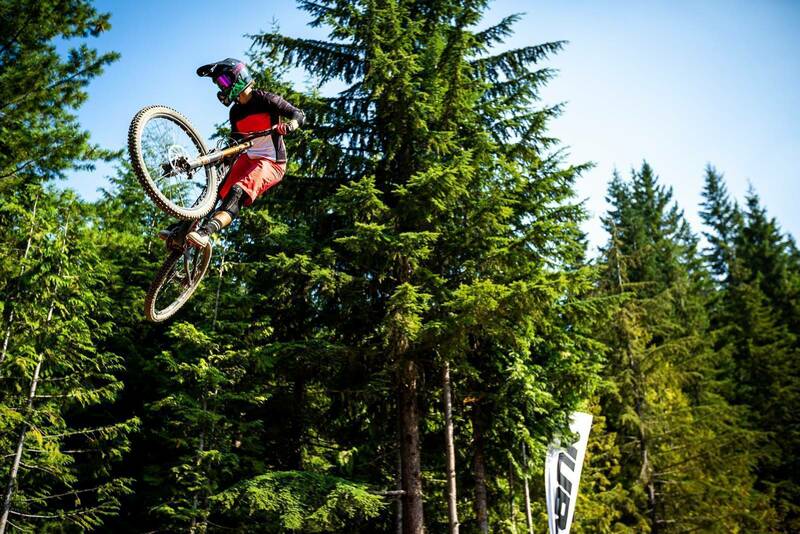 Carson Storch was flipping, no-handing, and of course getting sideways to claim a close second. 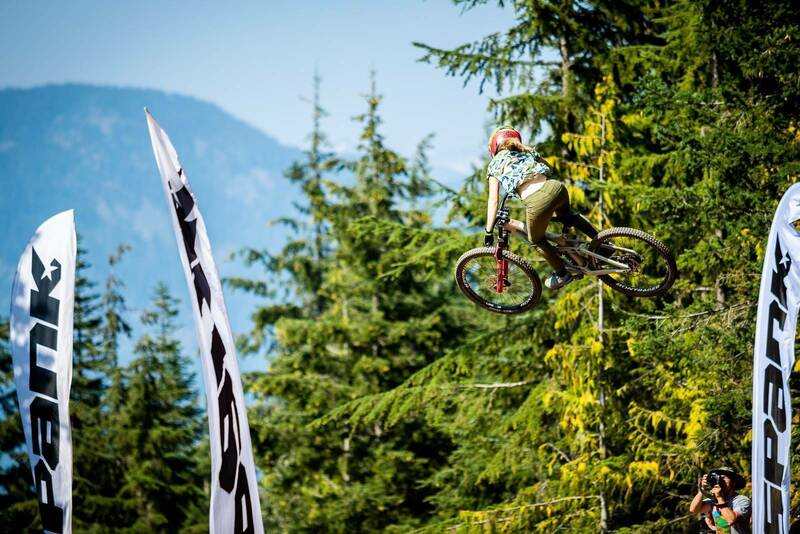 Casey Brown, showing us why she's undefeated champion of the classic Whip. 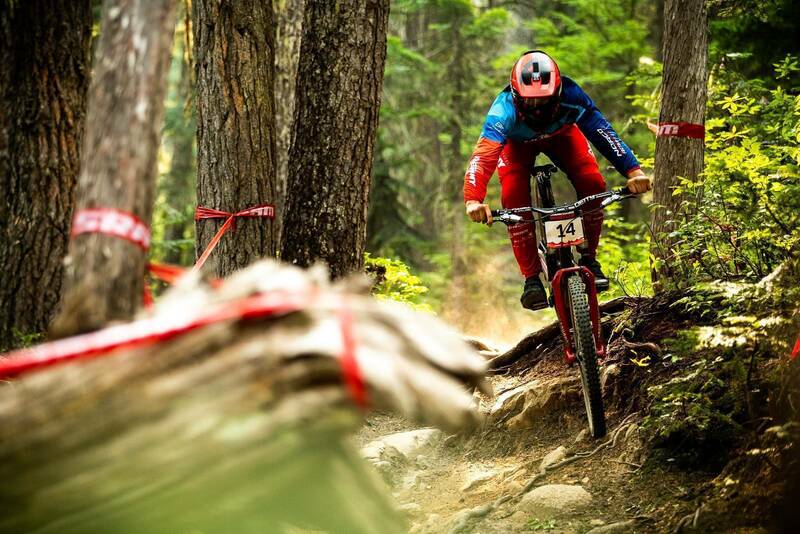 Jamie Hill, bringing home third to Manon Carpenter in second. 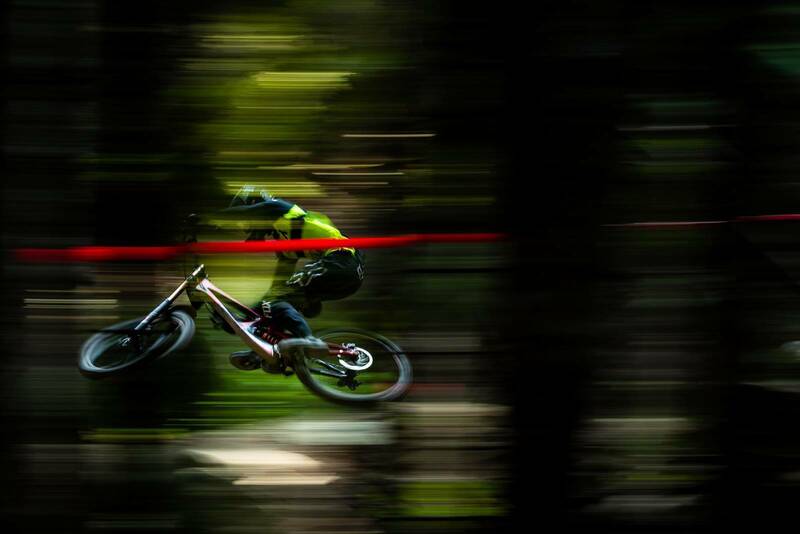 It was awesome to see Darren Berrecloth throwing down. Kade Edwards was towing in Casey Brown, and sharing airtime with her too. Allan Cooke took home first prize - and though he looks out of control here, he still ticked all the right boxes. 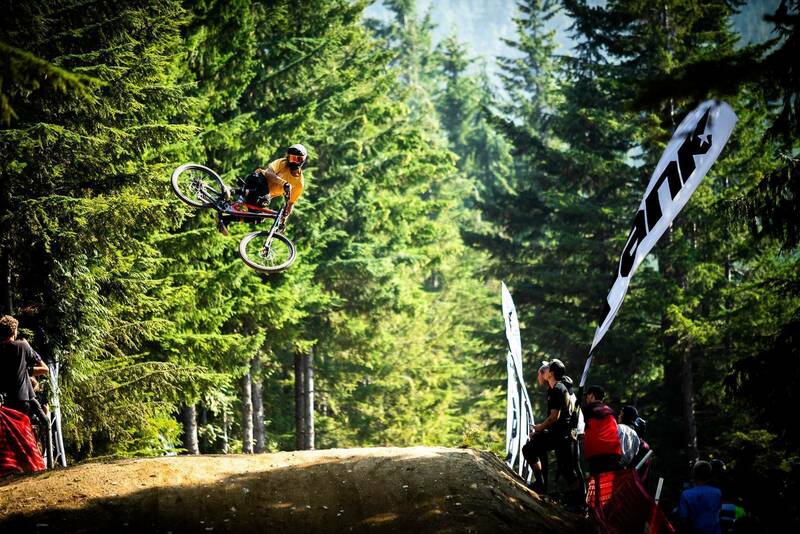 David McMillan definitely still has it - and on a fresh rig too. 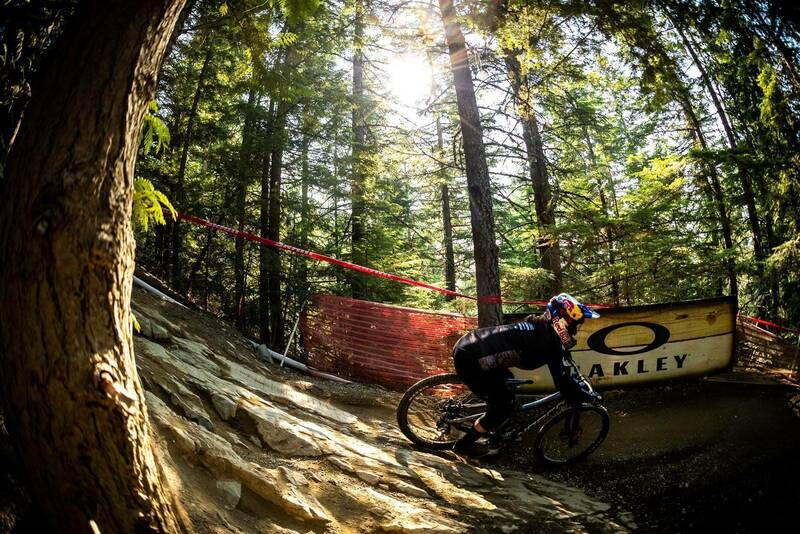 As the sun set on the valley, we kicked off with the Rockshox Pumptrack challenge. 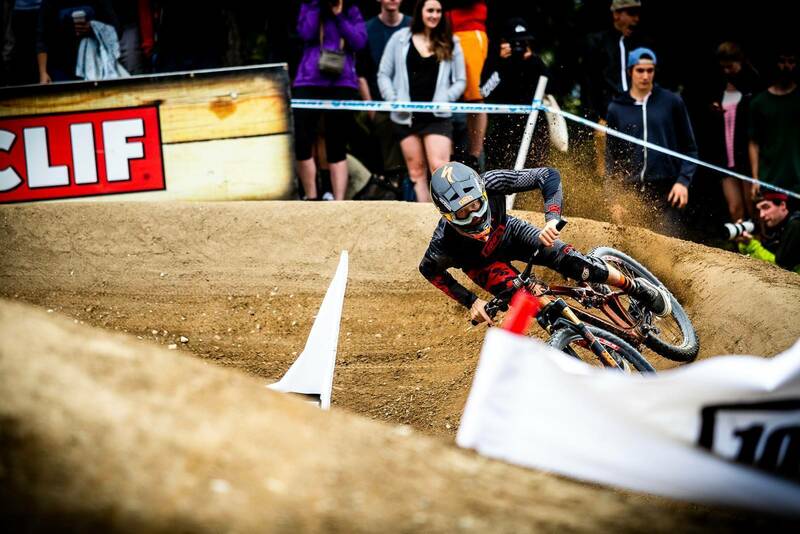 Keegan Wright was blazing through the rounds, and looked sure to take the win. He would however have to settle for fourth place. The crowds amassed up above the Village. 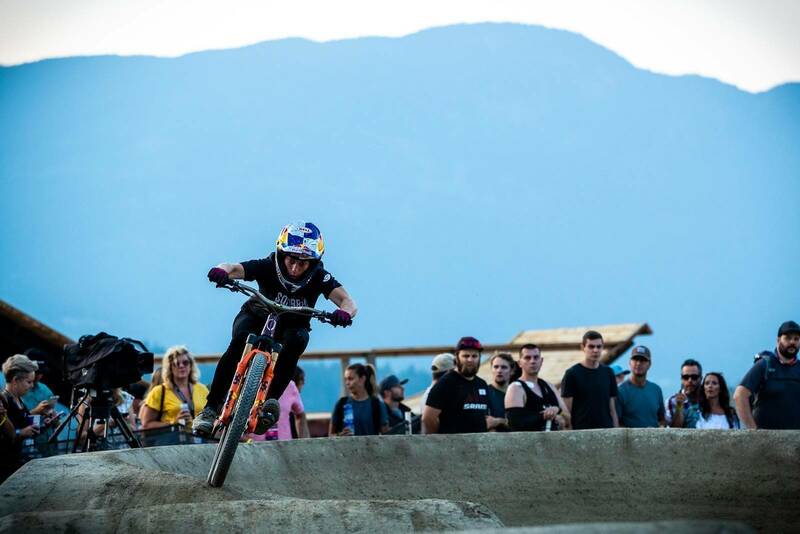 Jill Kintner, defending her previous Crankworx Pumptrack wins. Caroline Buchanan returns to the competitive stage following injuries, and after a tough battle against Kintner, she took out the win! It wasn't all between Buchanan and Kintner this year, though, with Kialani Hines being a serious threat too. Hines would settle for third. First place in the mens went to the underdog Collin Hudson. Second place to Chaney Guennet. Tomas Lemoine would have to settle for third. 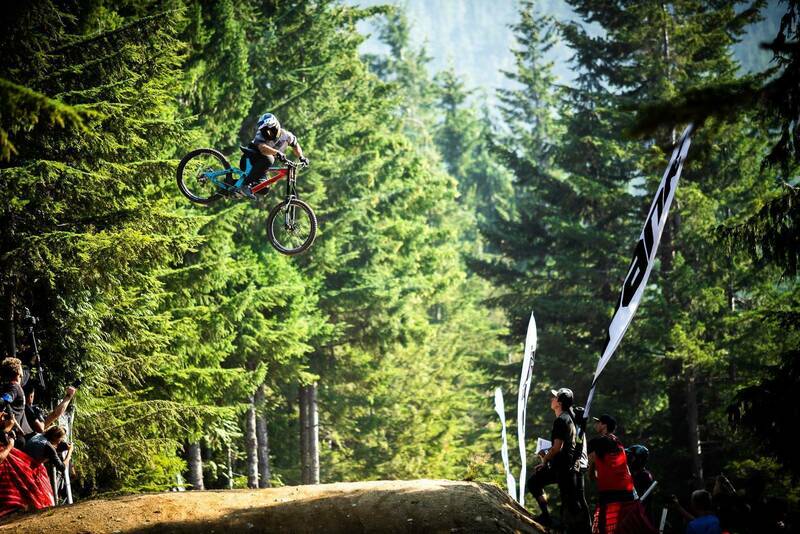 Stay tuned for more Crankworx coverage coming to your screens over the next few days! The sun wasn’t exactly shining as the week started out, but it didn’t take long for it break through the clouds to reveal the beautiful insanity of Whistler. 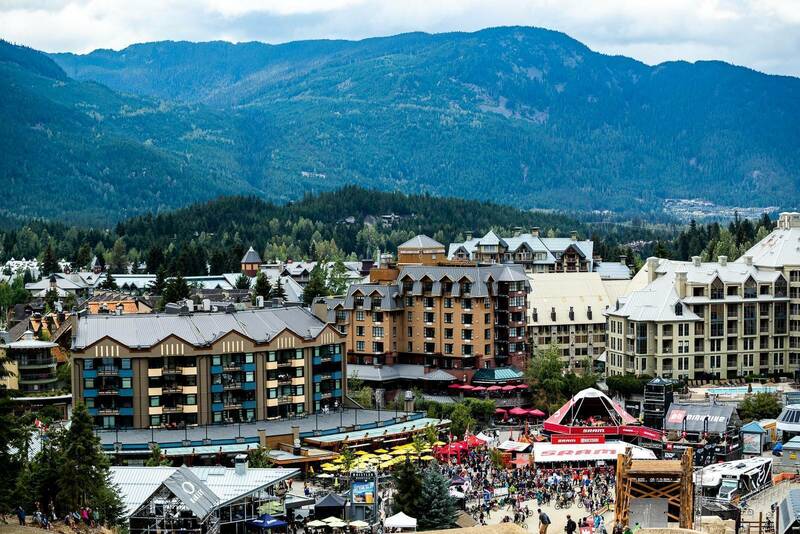 Welcome to Whistler Crankworx 2018, high in the Canadian mountains. Photos and Words by Nick Waygood. 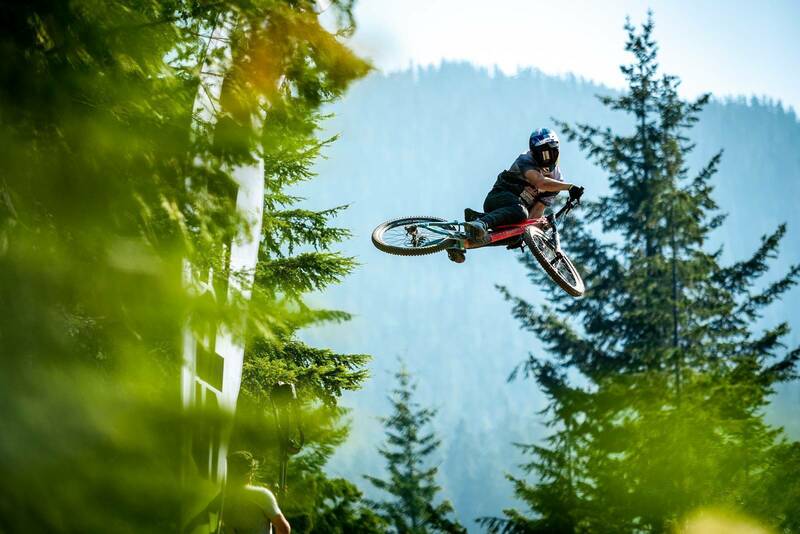 For those who are new to Crankworx, it’s a 10-day epic hosting 12 events for pros and amateurs alike. 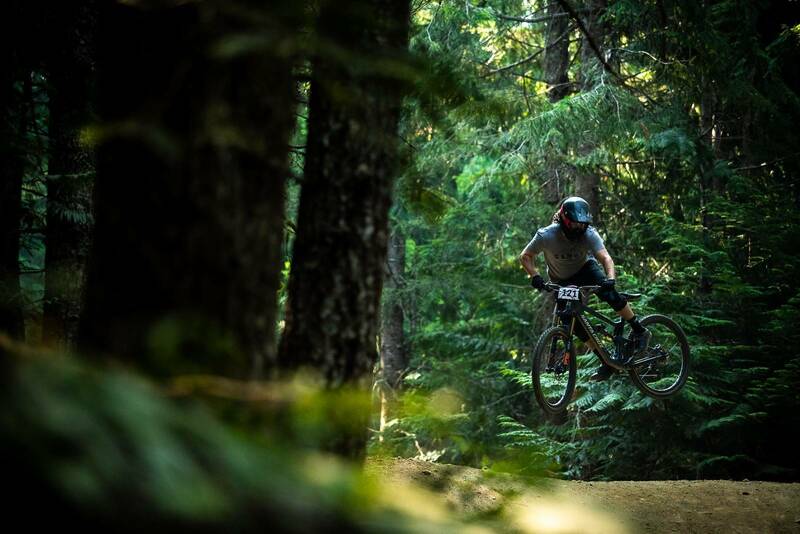 Over 1,100 competitors descend the hill, lap the courses, and throw down style in an attempt to win one (or more) of 7 titles. 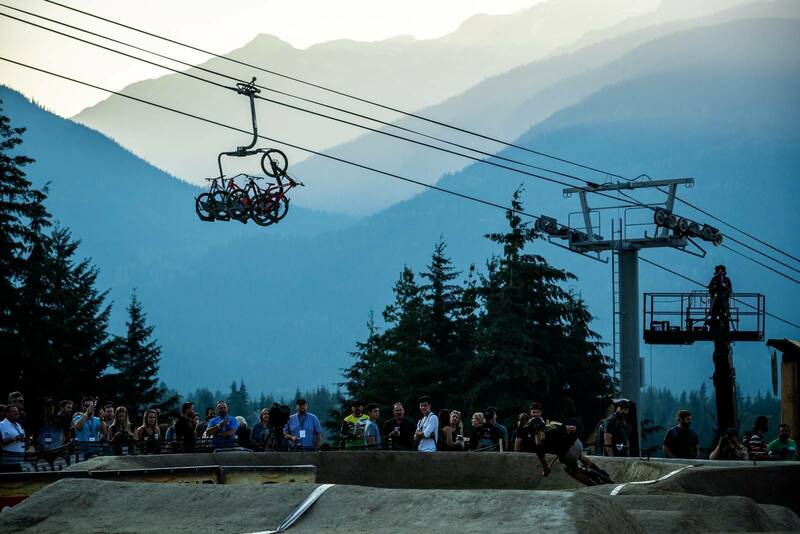 So, without further ado, let’s crack into the 15th annual Whistler Crankworx. We kicked off the week last Saturday with Dual Speed n Style, which is a combination of Dual Slalom (speed) and freestyle tricks (style). 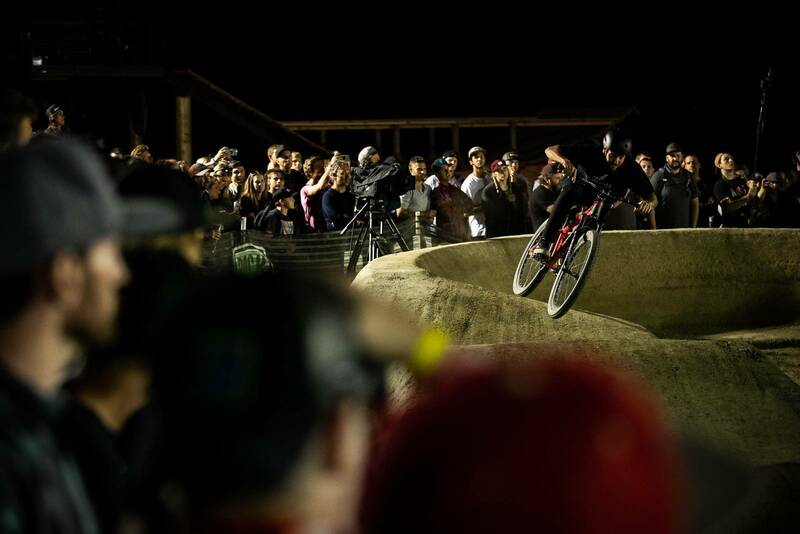 Pro riders went alongside in a race against the clock to see who could better the others’ trick bag. 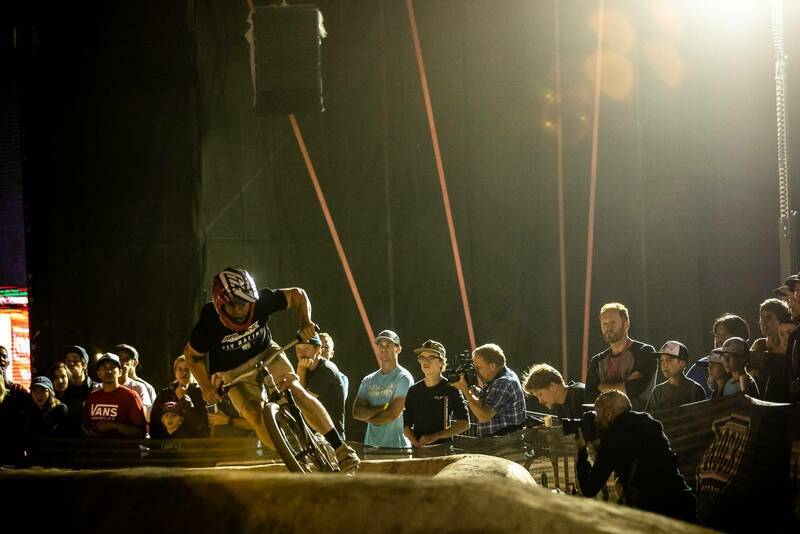 The event started with the top 16 qualifiers, and finished with an epic battle between Tomas Lemoine and Greg Watts. Kyle Strait was on fire for the first 3 rounds, until exhaustion got the better of him and Watts proceeded to the final. 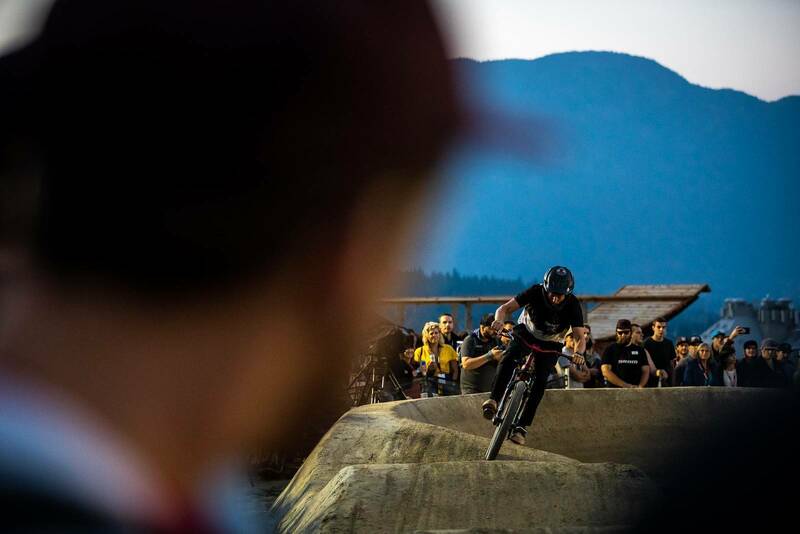 Sam Reynolds looked to be on a blazer and possible win, until a determined Lemoine took him out to win the competition, and the Crankworx world championship overall. Reynolds took 3rd. After a brief downpour, we awoke to smokey haze in the valley from a nearby bushfire and dry, dusty trails. Today was all about the Garbanzo Downhill. 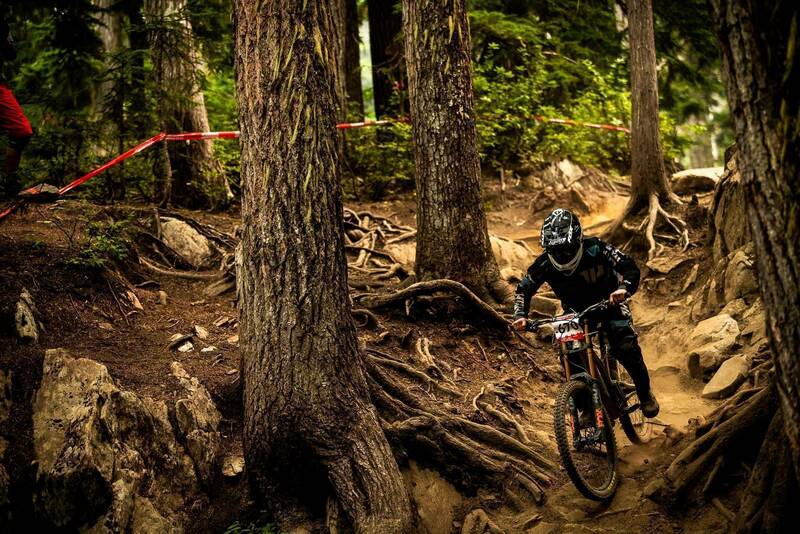 The Garbanzo Downhill is a 13-minute constant descent down Whistler Bike Park’s most difficult trails. 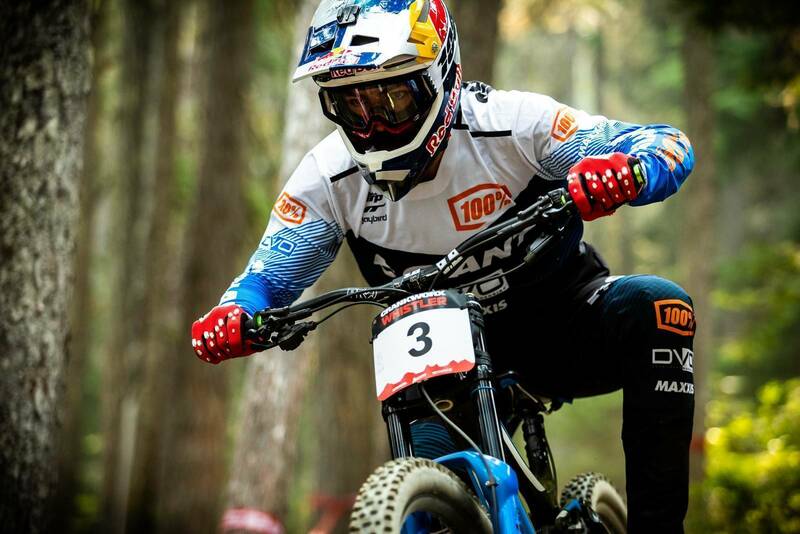 Endurance is key, and downhill-turned-enduro legend Sam Hill showed us that with a blazing 12 minute 46 second run down the 1000 metre-drop trail. 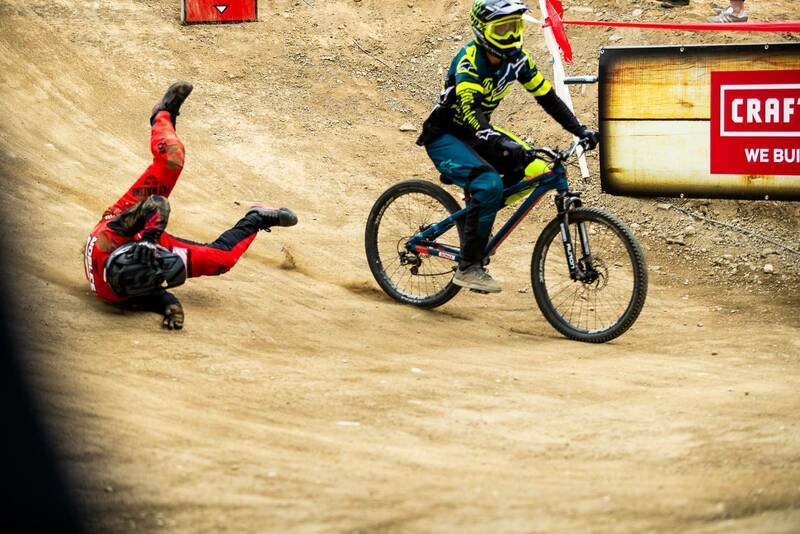 Defending champion Marcelo Gutierrez couldn’t quite make it happen, with a mechanical up top leading to a crash. 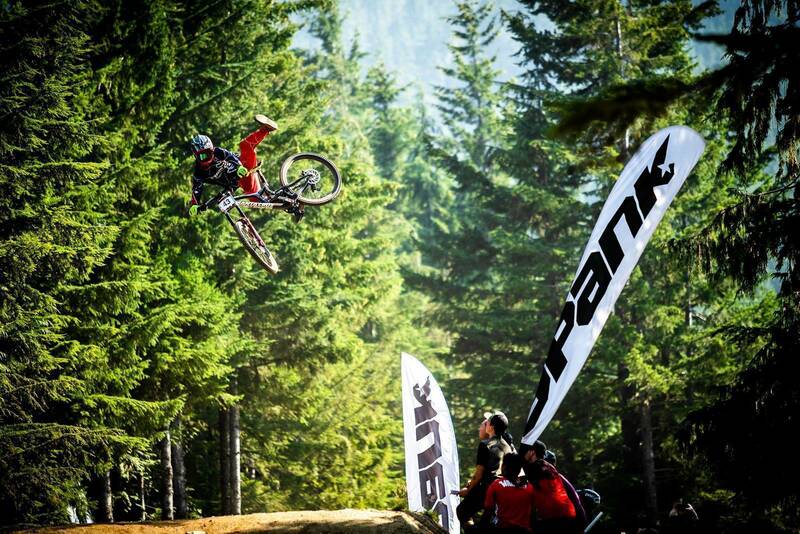 Jacob Dickson of Giant Factory Team claimed second, with Sam Blenkinsop taking 3rd. Of the women, Georgia Astle smashed the local crowd with a time of 14:29, ahead of Claire Buchar in second, and Aussie Tracey Hannah not far behind in third. 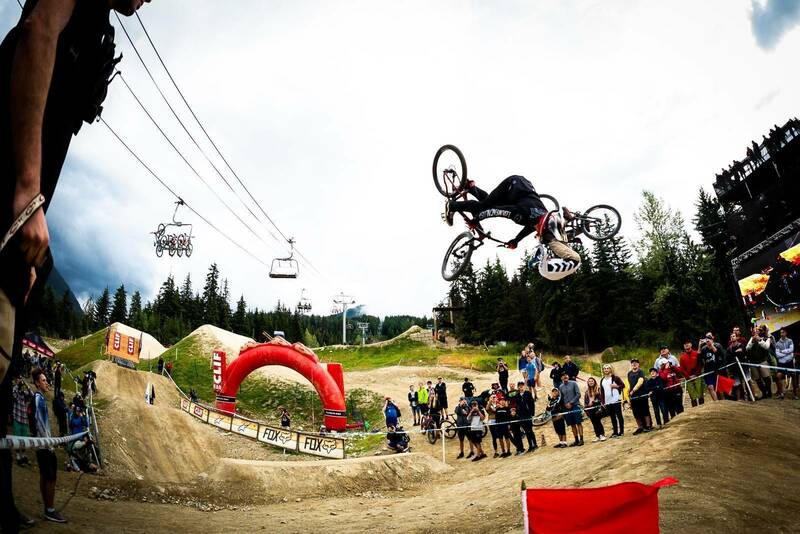 At this stage, Crankworx had well and truly kicked off. Races had been won, money handed out, beer consumed, and runs completed in amass. Next up, the legendary Fox Air DH. 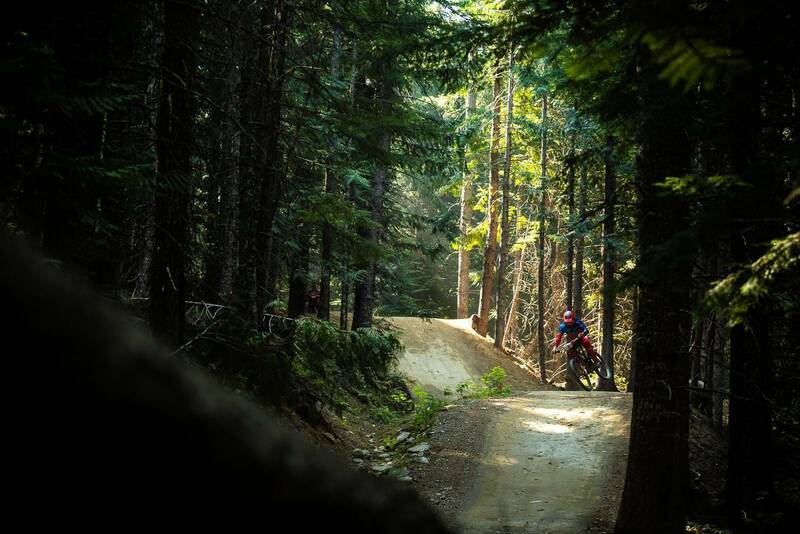 Running down Whistler Bike Park’s most popular trail, the Fox Air DH is a race run on the famous A-Line. 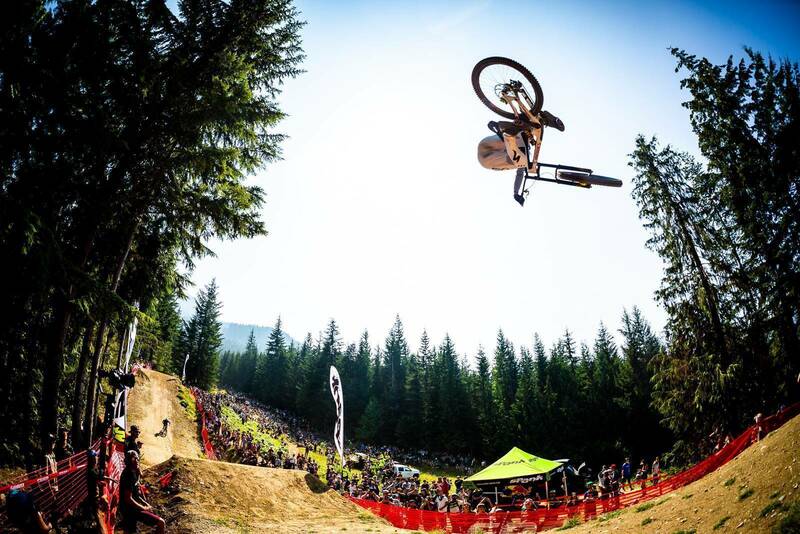 37 table-topped jumps, bumps, and step-ups are between 34 large berms on a rider’s descent. A 4 minute run has about 500 metres of altitude drop, with rock gardens and slabs scattered throughout. 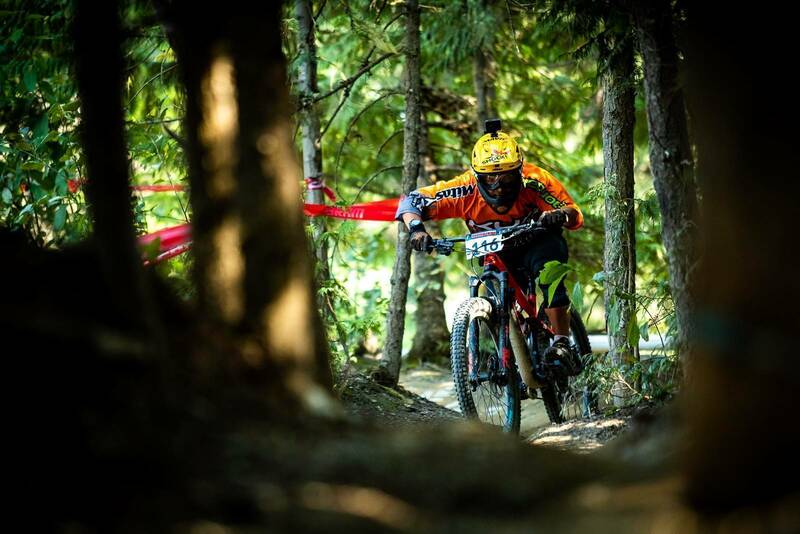 When it came to racing, it was Finn Iles in elite mens who, on his birthday, squashed, cornered, and styled his way down the course to claim first place. 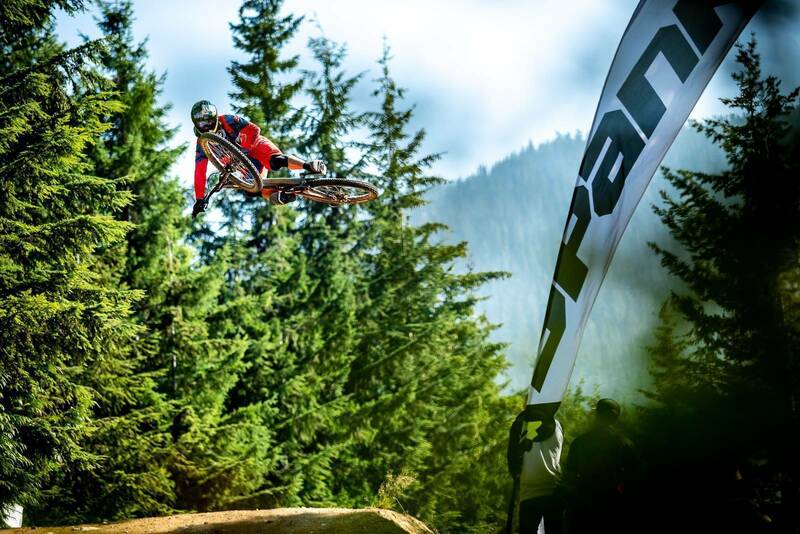 3 seconds separated the top three, with Magnus Manson and Bas Van Steenbergen coming in a close second and third. 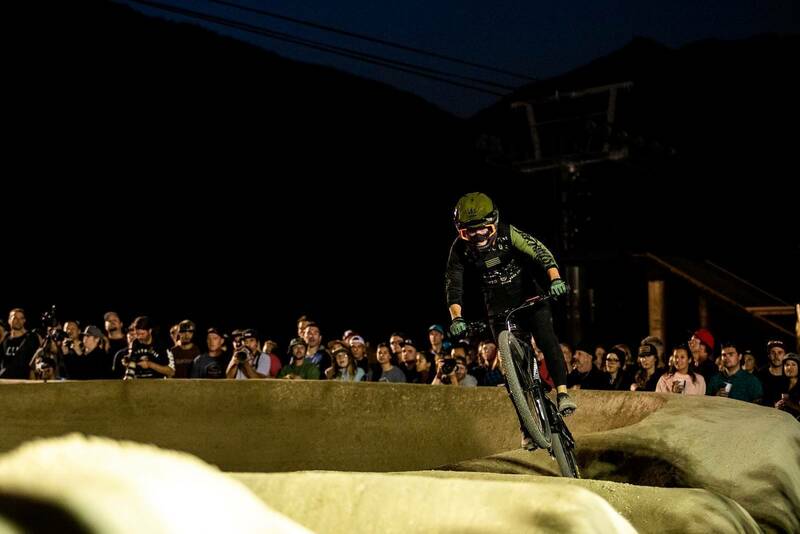 For the women, it was Jill Kintner who proved unbeatable with her 6th Fox Air DH win in a row, with Vaea Verbeeck 0.040 of a second back in second, and Casey Brown claiming third. 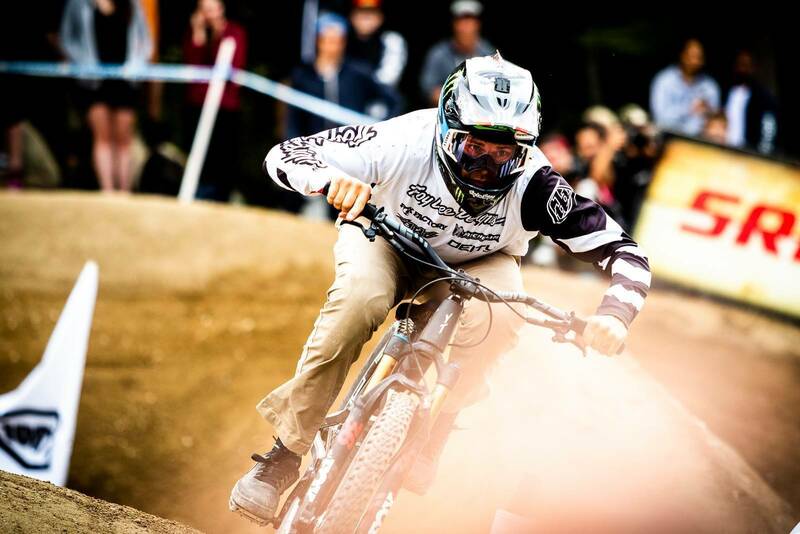 With the dust settling on A-Line, we hopped back up the hill the following day for the 7th day of Crankworx Whistler. 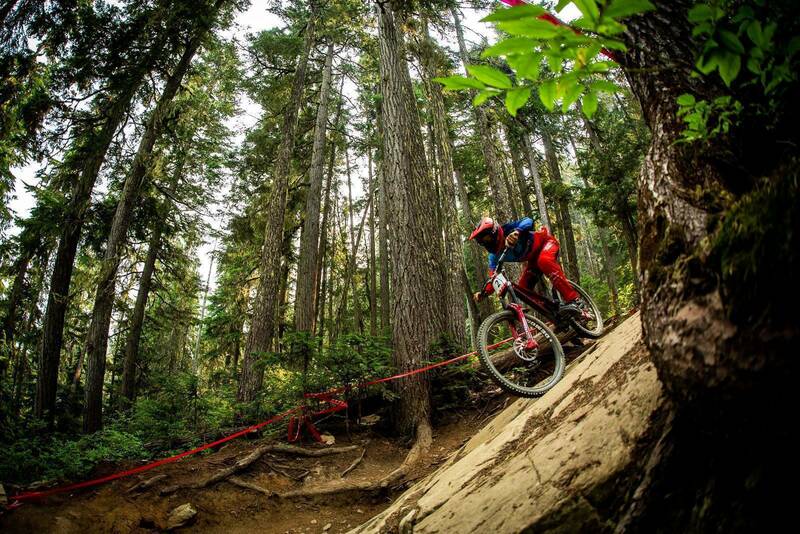 On today’s list, we had the Whip-Off Championship presented by Spank, and the Rockshox Pumptrack Challenge. 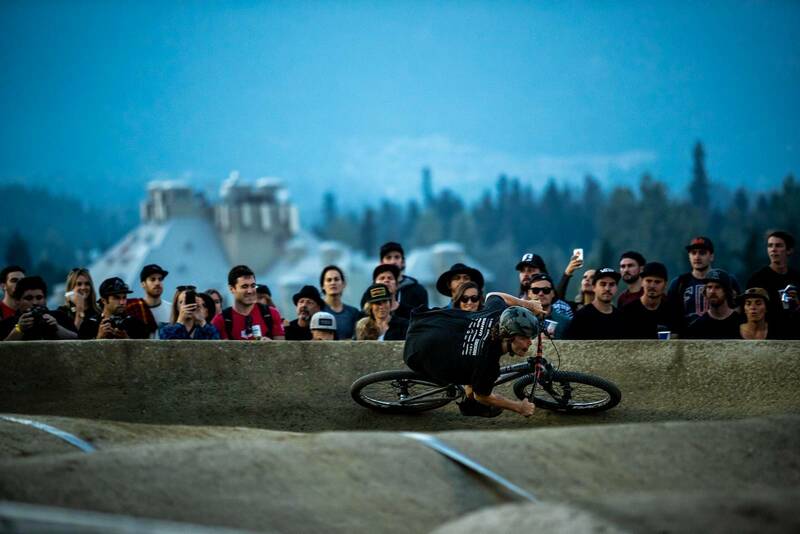 With the sun shining down at a balmy 30 degrees, riders sent it sideways over 40-foot tabletops in front of a crowd of hundreds. 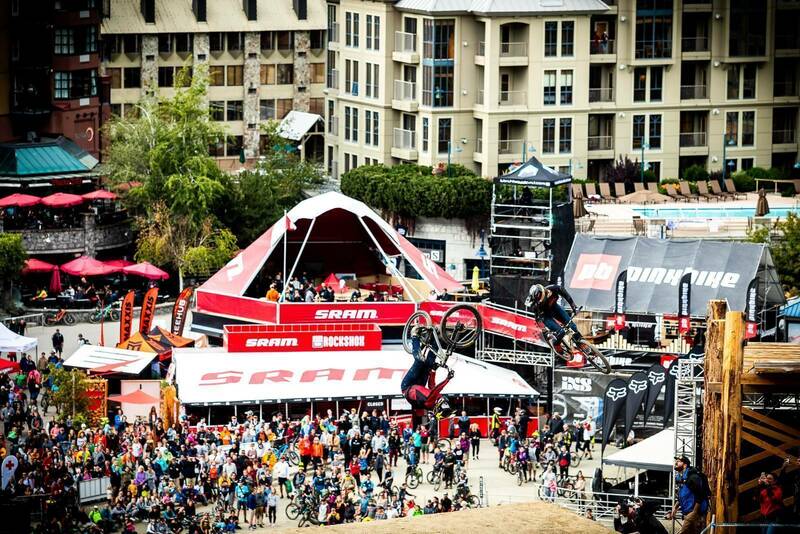 Judging for this type of competition was based off height, sideways-ness, smooth landings, and consistency. After an hour and a half of airtime, it was Allan Cooke who ticked all the right boxes and astonished the crowd with his constant style to take home top prize in the mens category. Carson Storch was a close second, with Thomas Vanderham in third. 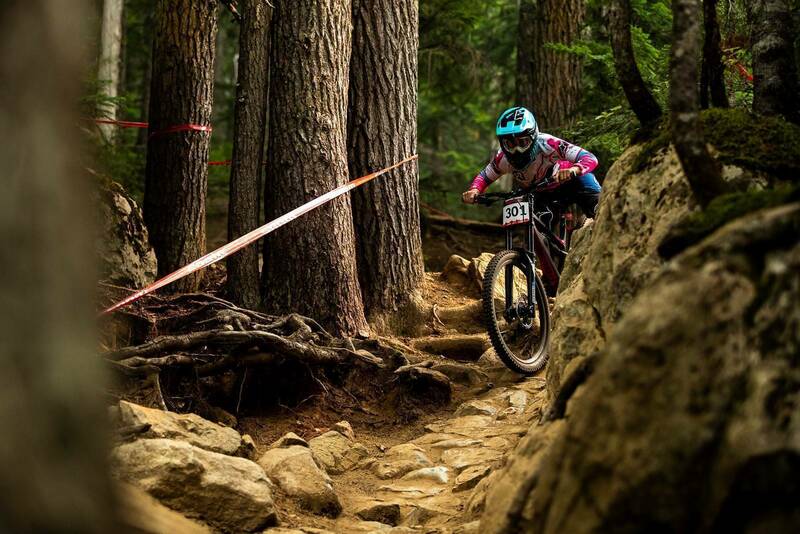 For the women’s category, undefeated champion Casey Brown showed us all how it’s done to take out her 9th consecutive Whip-Off win in Crankworx events, with ex-downhill-racer Manon Carpenter coming second ahead of Jamie Hill in third. 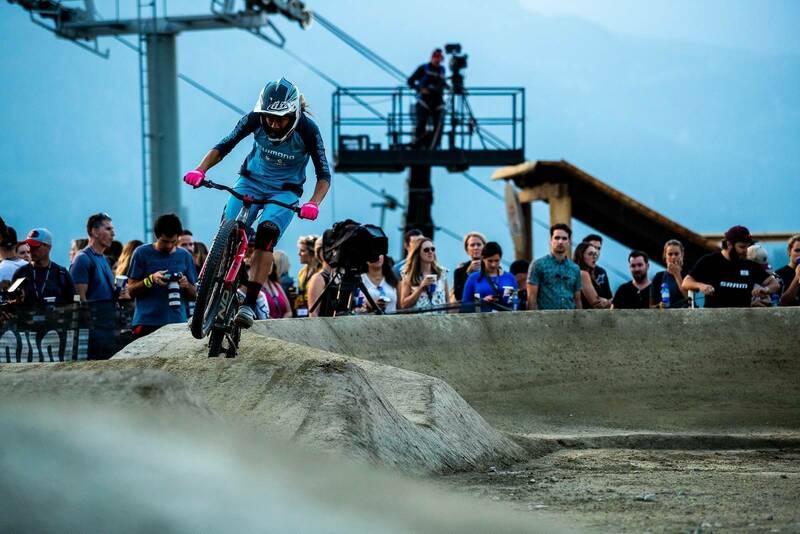 With riders going back for more, spectators headed down into the village for dinner and the next Crankworx spectacle (yeah, the fun never stops); the Rockshox Pumptrack challenge. It would be the first event that would see Aussie Caroline Buchanan return to competition after a tough 8 months away due to injury. As the sun set over the valley, the competition kicked off with a round of 16 men’s and round of 8 women’s. 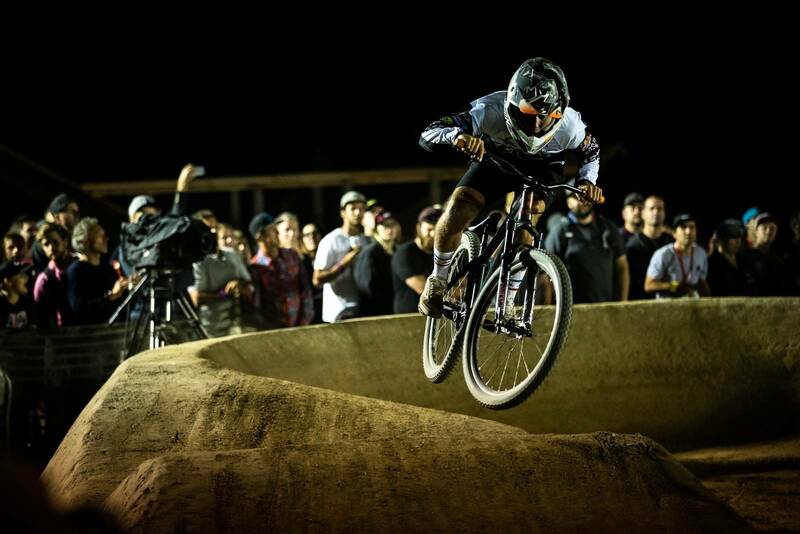 As laps were completed and the rounds trickled down, it would become evident as to who would win; Keegan Wright was hungry for another Pumptrack win, and Tomas Lemoine was determined to claim the Championship title. 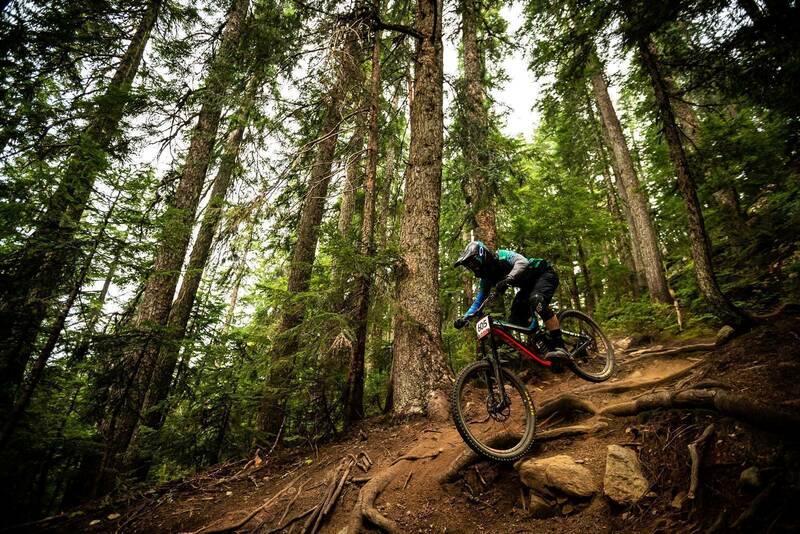 In the women’s category, Jill Kintner and Caroline Buchanan would have to fend off Jordan Scott and Kialani Hines (3rd) to have an old-fashioned face off. Buchanan won the first round against Kintner by 0.3 of a second, which was followed up by Buchanan taking the win, making it her first victory at her first race after her injury at the start of the year. In the men’s it would be an underdog to take home top prize. 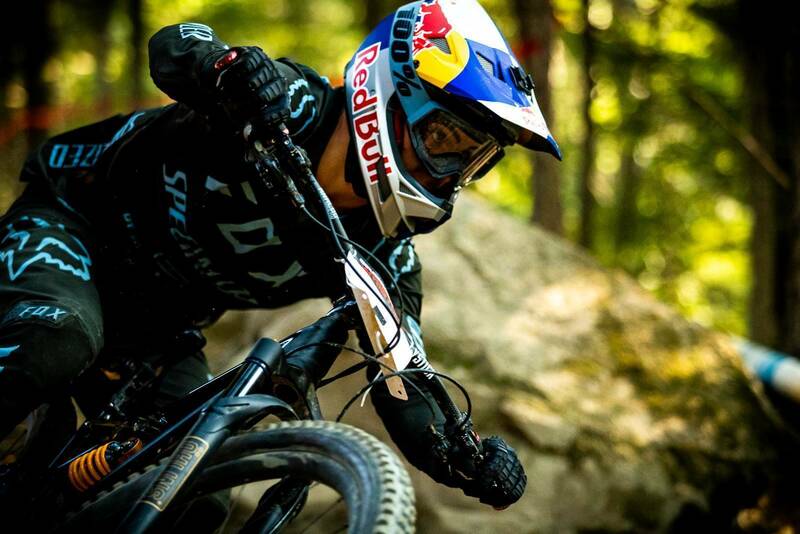 Collin Hudson pushed beyond the limit to best Chaney Guennet and Tomas Lemoine, who would claim second and third. Wright settled for fourth. 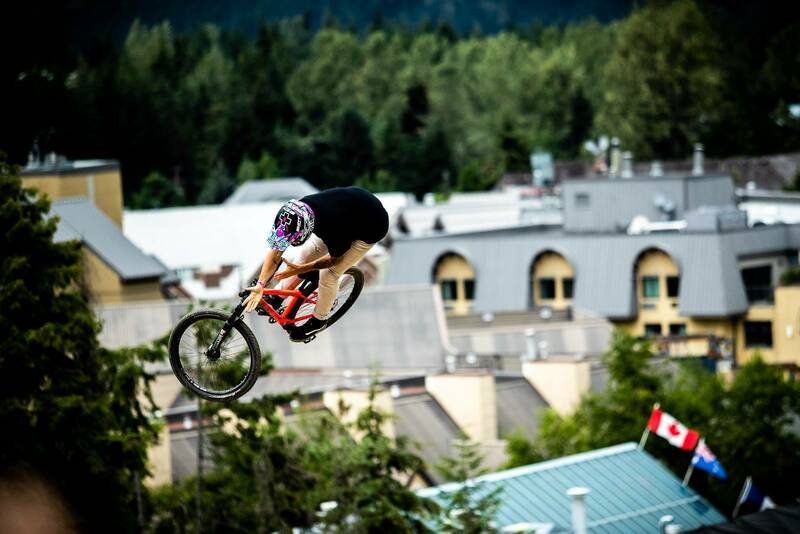 And just like that, we’ve wrapped up the first 7 days of Crankworx Whistler. 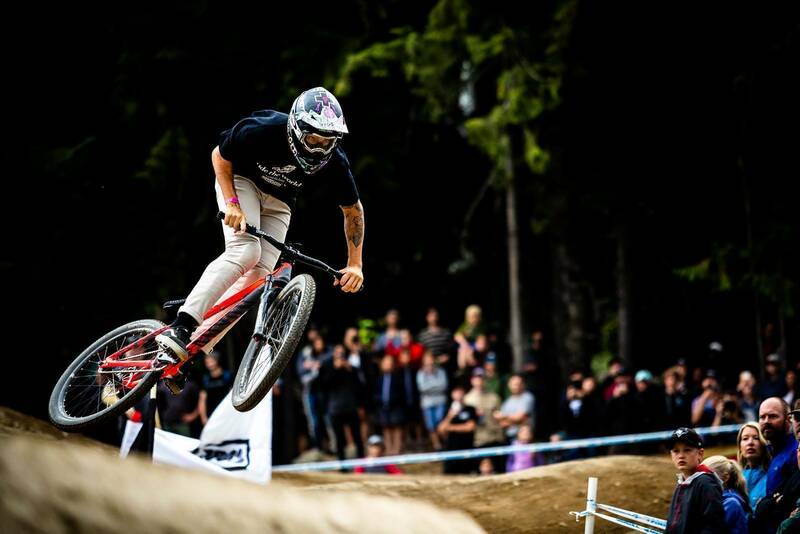 Stay tuned though for bike checks, Tech Expo highlights, and our end-of-week report, all brought to you thanks to Nick Waygood.